Credit disintermediation from banks - Has the corporate bond market come of age? The significant increase in inflows into mutual funds and their subsequent deployment is altering the scope of disintermediation in India. We look at this evolving milieu and its implications for bank intermediation in general and credit portfolio of banks in particular. We find that there is, (i) a gradual shift in corporate borrowings from banks to mutual funds as reflected in the contraction in corporate spreads for near-investment grades; and (ii) a significant differential between the risk-free rate and the benchmark lending rate for banks, viz., Marginal Cost of funds based Lending Rate (MCLR), which has given rise to disintermediation of bank credit for quality corporates. Historically, the banking sector has played a preeminent role in facilitating flow of resources to the commercial sector in India (refer Chart 1). However, this is currently under challenge as credit disintermediation, bypassing banking channels, has attained a critical mass. In the year 2011, the share of bank loans in credit to the commercial sector was around 56% and that of non-bank sources of credit (commercial paper, corporate bonds and external commercial borrowings), 44%.2 By 2017, this has reversed—the banks’ share had plummeted to around 38% and that of non-bank sources rose to 62%. Our brief study looks at this evolving milieu and its implications for the credit portfolio of banks. The dramatic growth in resources flowing to mutual funds (MFs) suggests that there is a discernible shift in the pattern of deployment of financial savings in India. 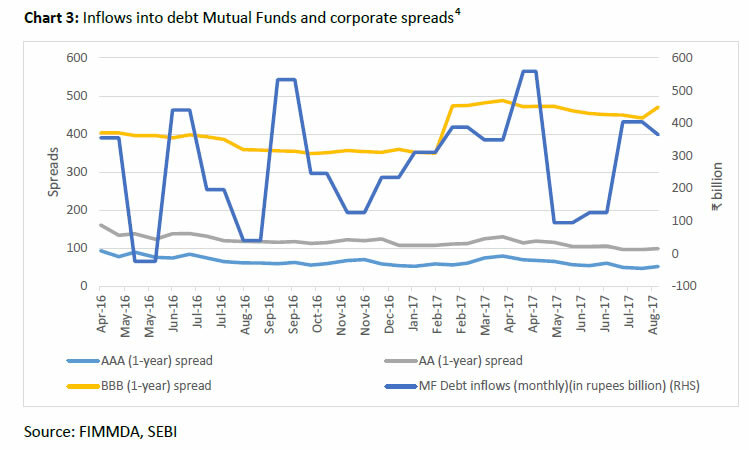 The flow of liquidity into debt-oriented mutual funds has given rise to a swelling of Money Market Mutual Fund (MMMF) corpus, which is outlined in Chart 2. The implications of the large MFs corpus in the context of equity valuation is well documented. However, its implication for debt valuation does not invite much attention. 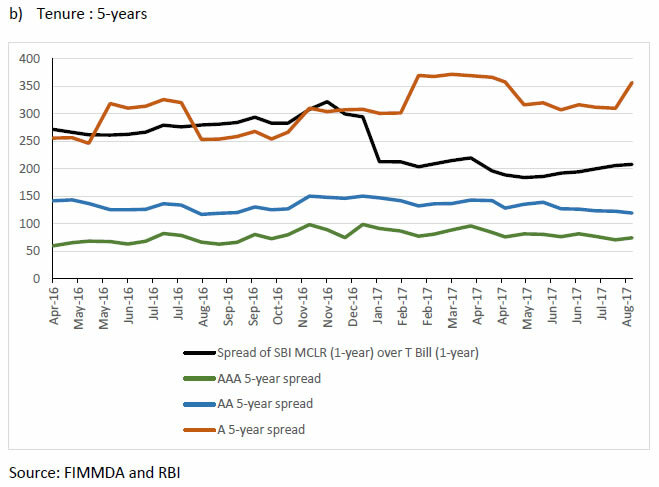 A major consequence of the fluctuation in MFs flows is the significant variation that is possibly induced in corporate spreads - derived from Fixed Income Money Markets and Derivatives Association (FIMMDA)3 valuation - as MFs chase creditworthy assets (Chart 3). While the FIMMDA spreads are not necessarily based on executed transactions; being used to value the corporate bond portfolio, they do have a bearing on the secondary market as well as primary market trades. A comparison of the movements of the cost of funds and loan-pricing benchmark (SBI 1-year MCLR5) over the last year is shown in Chart 4. 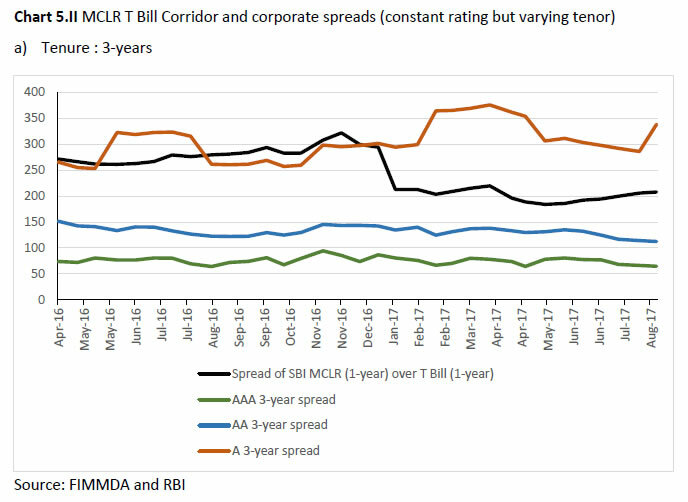 The graph exhibits a correlation between the policy rate and the T-Bill yields, while at the same time, indicating the significant corridor between the risk-free and risky unsecured rates (MCLR). 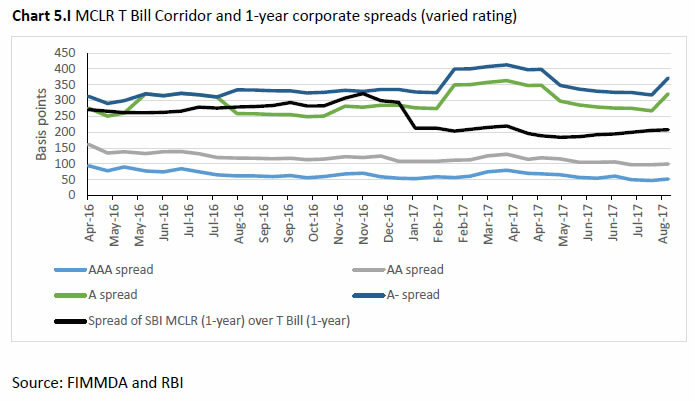 To elaborate further, in the first instance, corporate bonds of different ratings, each having a different spread over the risk-free rate, were compared with the spread of SBI 1-year MCLR rate over the 1-year T Bill rate. This is done to assess up to what rating it is beneficial for the corporates to access alternative sources of funding while keeping the tenor constant at 1-year. In the second instance, corporate bonds with a particular rating but different tenor (say, AAA bonds of 3-year, 5-year, etc.) were examined. The objective is to assess up to what tenors it would be favourable for a corporate with a specific rating to raise resources from non-banking sources of credit. Our analysis shows that over a 1-year investment horizon, rating grades up to ‘A’ can be accommodated within the corridor (Chart 5.I). On the other hand, for longer tenors, rating grades up to ‘AA’ can be accommodated over an intermediate investment horizon of 3 years and 5 years (refer Chart 5.II a & b). Incidentally, behaviour on the part of a few well-capitalised banks bear out our observation7. We further examined if the shift from Base Rate to MCLR had any implication for pricing of tradable bonds. Table 1 looks at the relative pricing of various grades of corporate bonds with varying tenors as on April 2016, when the MCLR guidelines became effective8. The table along with Chart 5.I (April 2016 data point) shows that, under the base rate regime, the rating grade below which banks turn competitive moves up a notch from ‘A-‘ (under MCLR) to ‘A’ (under Base Rate). However, there has been an improvement in the threshold rating in the 1-year tenor from ‘A-‘ to ‘AA-’ under MCLR in the recent period as is evident from Table 2. This is despite a sharp increase in the mutual funds corpus following demonetization. This could possibly be due to the increase in spreads for lower rating grades on account of economic uncertainty. 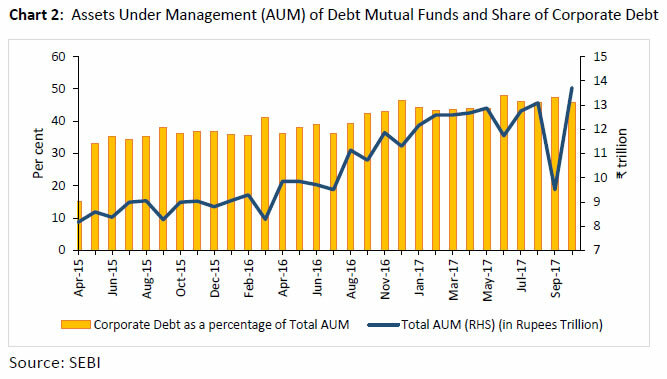 Nevertheless, given the sizeable increase in debt fund corpus (from ₹ 9.85 trillion in April 2016 to ₹ 13.09 trillion in August 2017), the possibility of high-rated corporates being financed by mutual funds is significantly higher. The rise of bank disintermediation in corporate credit does enable our financial system to become robust and more efficient in allocating risks. The unintended consequence of this process could potentially force banks, concerned with the shift in higher-rated borrowers to mutual funds, to either lower their credit standards or to engage in pricing that does not truly reflect their cost of funds. If banks lower their credit standards, the impact of such “adverse selection”, may add to further disintermediation and an increase in the expected losses of credit portfolio of banks. On the other hand, pricing pressure may also force banks to ration the credit and lend only to the high-rated borrowers even at the cost of imperfect pricing (Stiglitz, 1981). Both could potentially result in a failure to properly allocate funds in the loan market. In the absence of a well-capitalized banking system, the ability of banks to compete with mutual funds and other market intermediaries through reduction in intermediation cost is limited. This may not only hamper credit growth but also further weaken the risk culture in banks. Therefore, undertaking necessary structural reforms to restore a healthy banking sector is of paramount importance (Patel, 2017), (Acharya, 2017). At the same time, structural reforms supporting the corporate bond market such as the Insolvency and Bankruptcy Code (IBC) are likely to give a further fillip to non-bank finance for Indian borrowers. 1 R. Ayyappan Nair is Deputy General Manager and a Member of Faculty at the Reserve Bank Staff College, Chennai. M.V.Moghe and Yaswant Bitra are Managers in the Financial Stability Unit, Mumbai. The views and opinions expressed in this paper are those of the authors and do not necessarily represent the views of the RBI. 2 Compiled from RBI Annual Reports. 3The Fixed Income Money Market and Derivatives Association of India (FIMMDA), is an association of Scheduled Commercial Banks, Public Financial Institutions, Primary Dealers and Insurance Companies. It is a voluntary market body for the bond, money and derivatives markets. It has members representing all major institutional segments of the market. 4 The unexpected rise in BBB corporate spreads beginning January 17 as noticed in the graph above is due to drying up of liquidity in the credit rating spectrum of ‘A’ and below , leading to a revised methodology being adopted for determination of credit spreads. This resulted in the significant widening of spreads as seen above. 5 The Marginal Cost of Funds based Lending Rate (MCLR), introduced in April 2016 by the RBI, is an internal benchmark used by banks for pricing credit. The objective was to improve the efficiency of monetary policy transmission. Under the MCLR system, banks are required to use the marginal cost of funds for computing the cost of funds as opposed to the blended cost of funds used under the previous Base Rate system. 6 A comparison of a fixed rate MCLR to a floating rate cost as attempted above, prima facie, may appear to be inconsistent since it entails comparing a floating rate fixing to a fixed rate coupon. However, a fixing of MCLR significantly above the fixed-rate coupon implies at the least, a short-term negative carry. This may have a bearing on investment decisions of commercial banks subjected to short term P&L pressure. 7 Our analysis is consistent with press reports (“Banks offer loans linked to external mkt benchmark” - Financial Express article on June 22, 2017) that some of the well-capitalized banks, in order to stem the erosion in quality of credit portfolio, have resorted to risk-free-benchmark-based pricing (T-bill and G-sec), as opposed to MCLR-linked pricing. While their motivation to do the same is understandable, the usage of multiple benchmarks - for the same category of customers- may give rise to issues of selectivity and discrimination. 8 We assume quarterly rates for SBI Base Rate and accordingly annualize the spreads for the sake of comparison.